Halloween is one of my favorite food holidays. At what other time of year is it socially acceptable to enjoy pumpkin desserts, copious amounts of candy, AND gruesome, gross-out goodies, often all at the same time? It’s a sugar fiend’s dream come true! If you need me, I’ll be the one with my face buried in a bag of Halloween candy for the next few weeks. If you’re searching for the perfect dessert for an upcoming Halloween party, I have just the thing! These Vampire Bite Truffles are so easy, so good, and so cute…well, maybe it’s not accurate to call a candy that features dripping blood cute, but they do have a certain spooky charm. 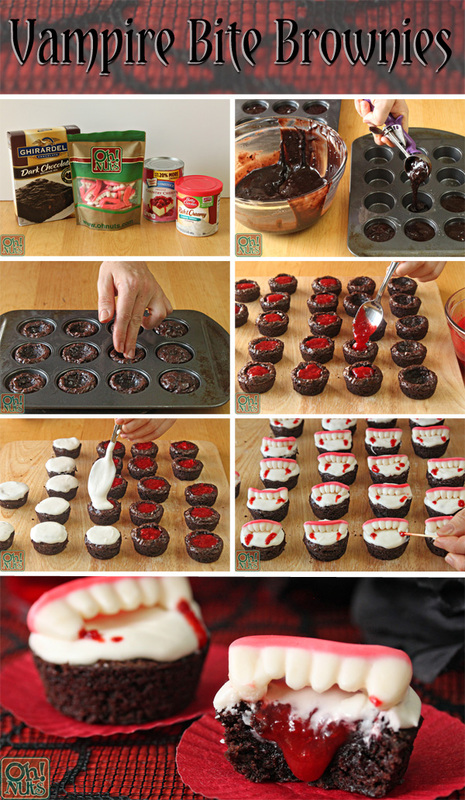 The idea is simple: fudgy brownie cups are filled with a bright red cherry pie filling, sealed with frosting, and topped with vampire teeth gummies and specks of cherry blood. 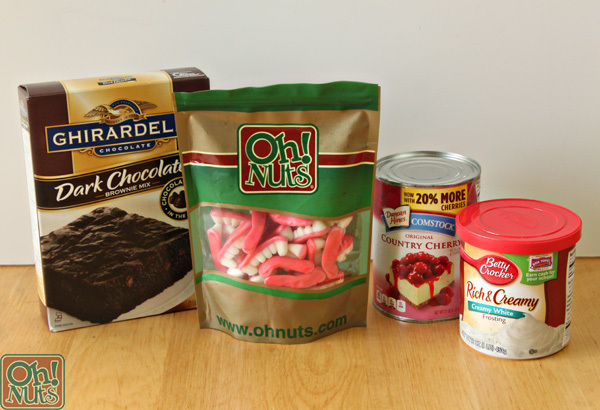 This recipe mostly uses prepared ingredients from a store, so it comes together quickly–although you’re certainly welcome to be an overachiever and make your own brownies or jammy filling! 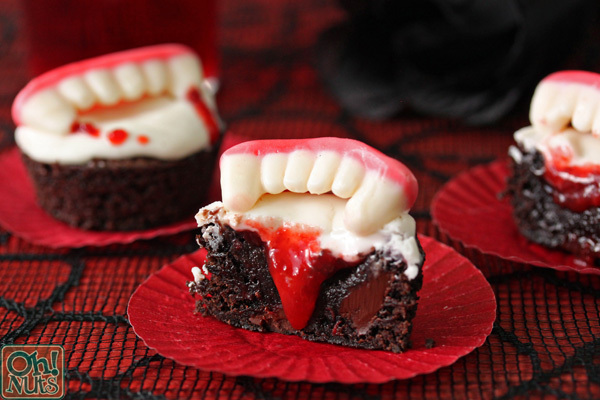 The best part about these Vampire Bite Brownies is that the filling is entirely hidden, so no one would guess their inner secret just by looking at them. 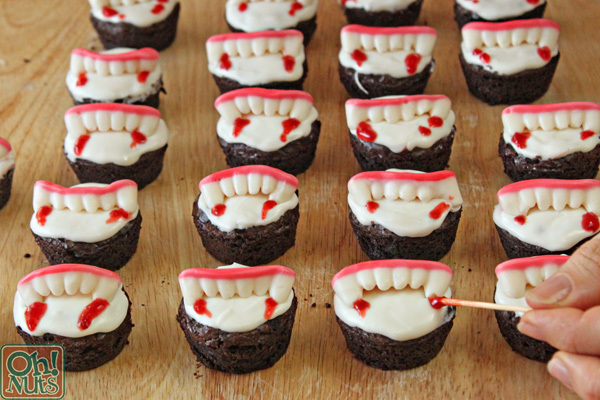 Imagine your guests, innocently taking a bite of these cute little brownie cups, only to have cherry “blood” ooze out! The fruity, chewy vampire teeth gummy on top adds the perfect finishing touch. 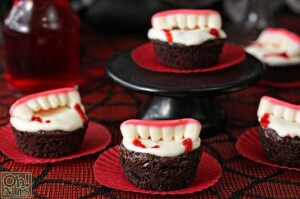 Ready to make your own Vampire Bite Brownies? Read on! Preheat the oven to 325 F. Spray several mini muffin pans with nonstick cooking spray. (This recipe makes about 28-30 mini brownies.) Prepare the brownie mix according to the package directions. 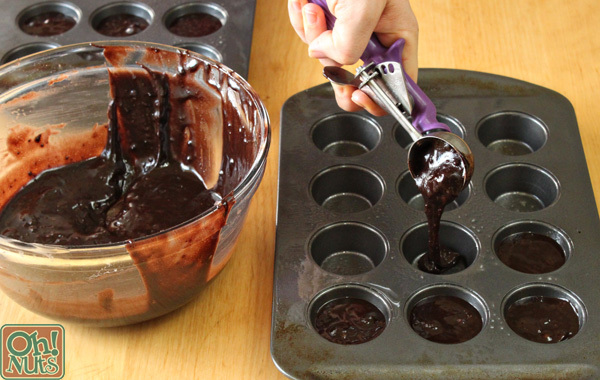 Use a cookie scoop or tablespoon to fill the mini muffin pans with the brownie mix, filling each cavity about 2/3 full. Bake the brownies for 15-20 minutes, until they are shiny and puffed on top, and a toothpick inserted into the center comes out with just a few moist crumbs attached. 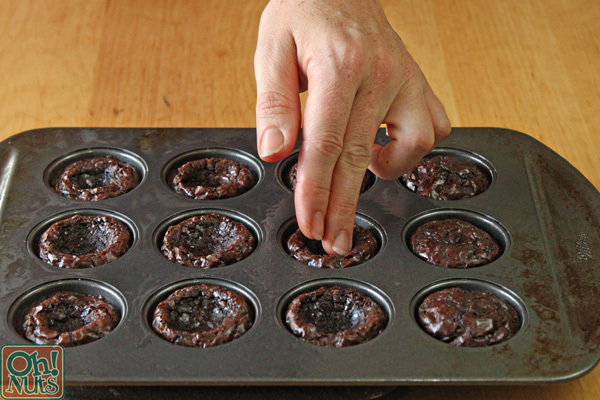 Remove the trays from the oven, and let the brownies cool for one minute. While they are still quite warm, carefully use your fingers to press down into the center of each brownie to form a well. If this is too hot for you, you can use the handle of a wooden spoon or a dowel to make the indentation. Let the brownies cool completely. Once the brownies are completely cool, run a small metal spatula or knife around the outside of the brownies, and pop them out of the pan. If you have trouble with the brownies holding together, you can try chilling the pans briefly to make the brownies firmer and sturdier. They are difficult to remove if they’re very cold, because they tend to stick to the pan, so keep a close eye on them if you do decide to chill them. Blend the cherries briefly using a blender or stick blender, until they are in small chunks and have a jammy consistency. 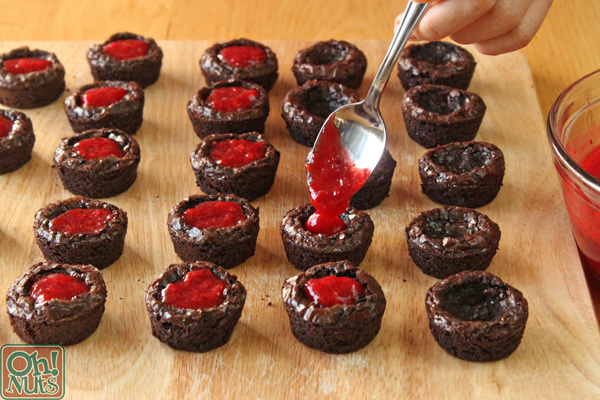 Place a small spoonful of cherry filling in the center of each brownie cavity. Try to come up level with the top of the brownies, and not extend over–this will make it easier to top them with frosting. 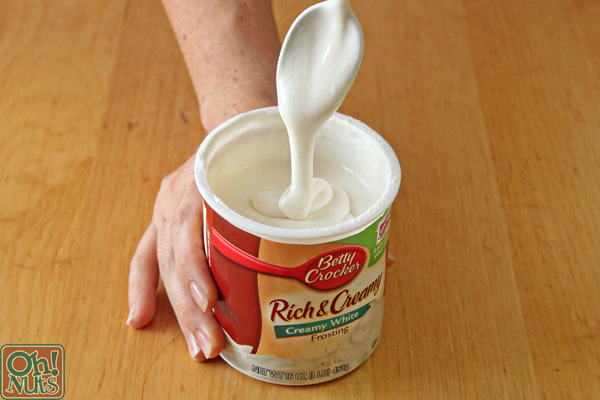 Remove the lid and foil wrapper from the white frosting, and place it in the microwave for 15 seconds. Stir well, then microwave for an additional 10-15 seconds, until it flows freely from a spoon. Use a spoon to pour a small amount of frosting on top of each brownie, spreading it to the edges so it covers the cherry jam completely. 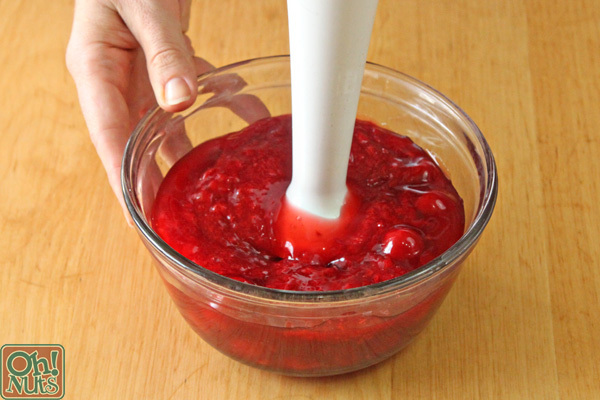 I found it easiest to place a big dollop in the center, over the cherry jam, and then once the jam was covered, to spread it out to the sides. You’ll want a fairly thick layer–a thin layer runs the risk of having the cherry filling show through or mix with the frosting. That will still taste fine, but it won’t have the clean look we’re going for. Refrigerate the tray of brownies briefly, to set the frosting on top. It doesn’t need to be hard, but it should have some body and not be soft and sticky to the touch. Once the frosting is set, top each brownie bite with the vampire teeth gummies. Use a toothpick to dab a little bit of cherry puree on the tip of each fang to resemble dripping blood, and you’re finished! 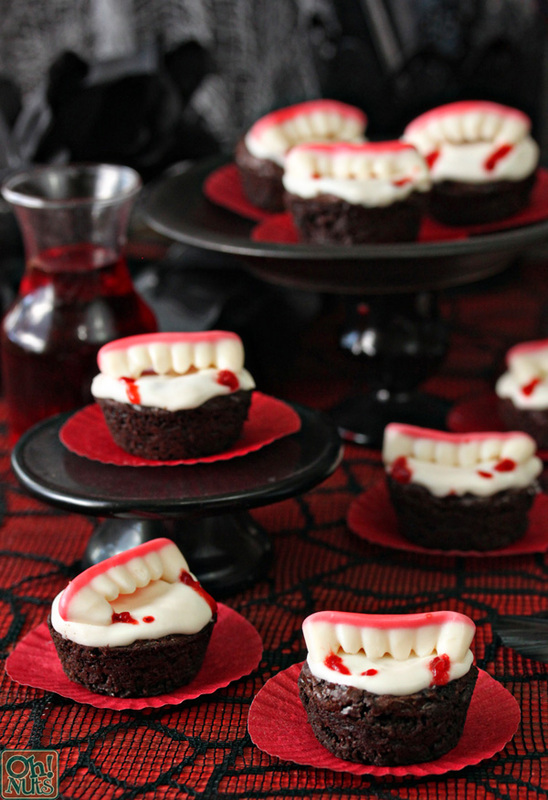 These Vampire Bite Brownies are best enjoyed within a day of assembling them–the cherry jam starts to soften the frosting after about a day. However, you can make the brownie cups several days in advance and just assemble on the day of the party, if you’d like. I hope you enjoy them! As always, there’s a printable recipe and pin-able image down below. Happy Halloween! 16-oz can prepared white frosting (not "whipped" variety"
Preheat the oven to 325 F. Spray several mini muffin pans with nonstick cooking spray. Prepare the brownie mix according to package directions. 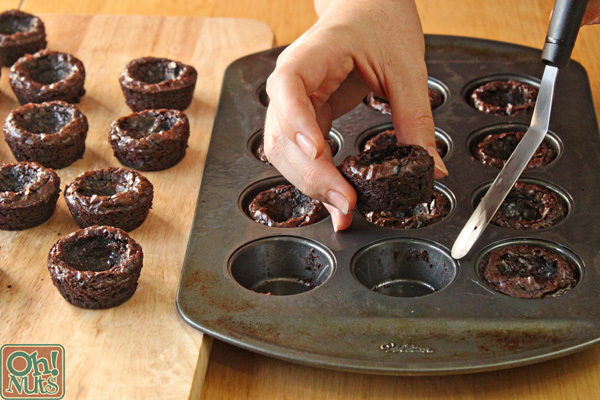 Use a cookie scoop or tablespoon to fill the mini muffin pans with the brownie mix, filling each cavity about ⅔ full. You should get about 28-30 brownies from this recipe. Remove from the oven, and let cool for one minute. While they are still quite warm, carefully use your fingers to press down into the center of each brownie to form a well. Let the brownies cool completely. 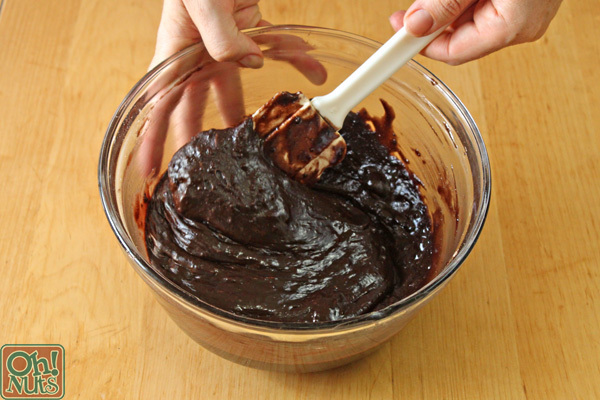 Once cool, run a small metal spatula or knife around the outside of the brownies, and pop them out of the pan. If you have trouble, you can try chilling the pans briefly to make the brownies firmer and sturdier. Blend the cherries briefly using a blender or stick blender, until they are in small chunks and have a jammy consistency. Place a spoonful of blended cherries into the center of each brownie. 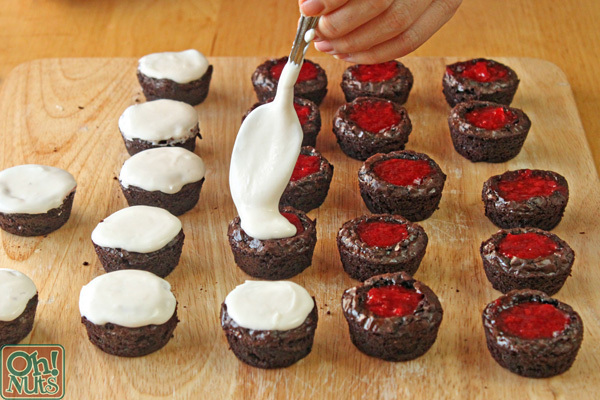 Use a spoon to pour a small amount of frosting on top of each brownie, spreading it to the edges so it covers the cherry jam completely. Refrigerate the tray of brownies briefly, to set the frosting on top. It doesn't need to be hard, but it should have some body and not be soft and sticky to the touch. 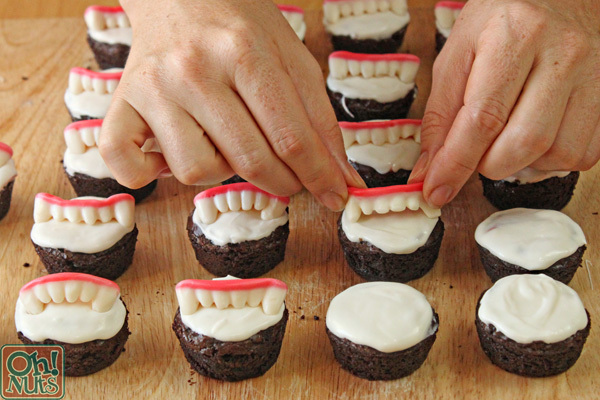 Once the frosting is set, top each brownie bite with the vampire teeth gummies. Use a toothpick to dab a little bit of cherry puree on the tip of each fang to resemble dripping blood. If you don't want to use the cherry pie filling, you can substitute 1½ cups of any red jam instead.